What is officially the George Mason River Retreat is to most people who visit this special area simply the Mason Tract. Both titles refer to auto magnate George Mason who loved to fish the South Branch of the Au Sable River so much he purchased the area in the 1930s and upon his death bequeathed it to the state of Michigan. Paralleling the west bank of the river is the Mason Tract Pathway, an 10.3-mile network of trails from M-72 to Chase Bridge on Chase Bridge Road (also known as County Road 519). The river moves in and out of view along this trek, as the trail works its way across the bluffs the South Branch flows between. What is officially the George Mason River Retreat is to most people who visit this special area simply the Mason Tract. Both titles refer to auto magnate George Mason who loved to fish the South Branch of the Au Sable River. Mason made his fortune in the automobile industry and, in the 1930s, purchased a large tract of land that borders the South Branch from another auto magnate, Clifford Durant of the Durant Motor Car Company. It became his personal wilderness, an area of undeveloped woods and clear water where he would go with a flyrod in hand to escape the daily routines of Detroit. Mason loved his river so much that upon his death in 1954 he bequeathed it to the state of Michigan on three conditions. The land had to be a permanent game reserve, never to be sold; camping was to be banned; and the state had to accept the gift within two years of Mason's death. The conservationist's plan was to preserve his wooded retreat by opening it up to everyone who loved the Northwoods, and it was Michigan’s responsibility to maintain it that way. The original gift of 1,500 acres has since been enlarged to 4,493 acres but its crowning jewel is still the South Branch that spits the Mason Tract in half, offering fly anglers access 11 miles of some of the finest trout waters in the state. These undeveloped qualities of the river here that is so attractive to anglers and the fact that mountain biking has been banned on the pathway have made the area popular with hikers as well. Paralleling the west bank of the river is the Mason Tract Pathway, an 10.3-mile network of trails from M-72 to Chase Bridge on Chase Bridge Road (also known as County Road 519). The river moves in and out of view along this trek, as the trail works its way across the bluffs the South Branch flows between. For many, beginning at one road and ending at the other presents a transportation problem. Beyond backtracking the entire way or using two vehicles, the only other solution is to walk only a portion of the pathway. The best section of trail for this choice is the northern half, where two small loops have been set up. 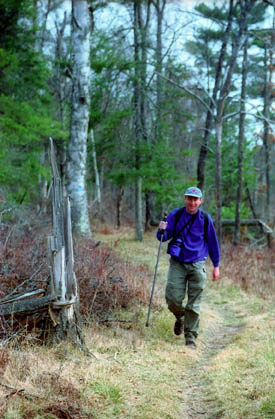 The Campground Loop is 2.4 miles from the M-72 trailhead, around the small loop around Canoe Harbor, and back. The Thayer Creek Loop is an 7.7-mile, round-trip hike from M-72 and much more interesting as you spend a good portion of the time skirting bluffs along the river. The description below is the Mason Tract Pathway in its entirety with the longest portion of each loop. This makes for a 9.6-mile hike that, for most people, necessitates spotting a car at one end. Find a friend, this is an excellent trek that takes most hikers four to five hours. Tackle the trail in the morning or early evening after canoeists have departed for the day, and you can sit quietly on the banks and watch trout rise to feed on insects. Or even better watch an angler cast a floating line and with such precision that he or she is able to drop a delicate fly in the smallest pockets of water between deadheads and sweepers. If a trout rises and takes that bait of feathers and thread you’ll understand why Mason loved this river so much. The Mason Tract Pathway is well marked with blue dots and triangle pathway markers, and along the way there are 12 numbered posts with locator maps, though some might be missing. The trail begins by winding through a sparse stand of pine and then crossing a two-track dirt road with a half mile, moving into a thicker forest on the other side. In another quarter mile, you reach post No. 2 with the loop around Canoe Harbor Campground. Heading east (left), you begin by following a two-track road, then veering off it where a pathway map has been posted. The trail is now skirting the campground and soon dips down to provide the first sight of South Branch. 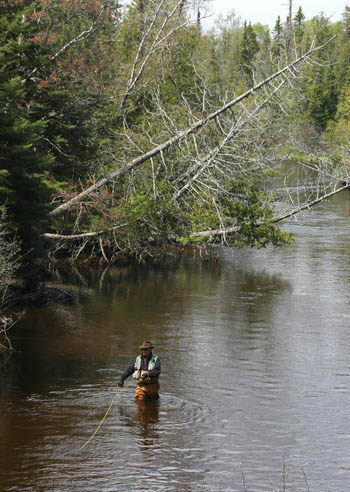 Here is a classic Michigan trout stream. The river is 20 to 30 yards wide, less than four feet deep in most places, bordered along the banks by sweepers and deadheads, and is crystal clear. The trail follows the river briefly, then at Mile 1.2 from the beginning, comes to the campground's canoe landing, picnic area, and vault toilets. The trail heads southwest, skirts a high bank forested in red pine and hardwoods, and arrives at post No. 3, the return loop to the campground, at Mile 1.4. Located here is a bench, where on a quiet morning you can sit and listen to the river below. Continuing south (left), the pathway winds over several small hills and swings away from the river to within sight of the dirt access road. It then descends back into view of the South Branch and arrives at post No. 4 in a parking area at Mile 1.8, from which several trails lead to the water's edge. This is the Dogtown access point and marks the spot where market hunters in the 19th century used to gather. Dogtown picked up its name from all the dogs the market hunters used to kill grouse, pheasant, and other wildlife for sale to restaurants in the cities. For the next half mile, the trail stays within sight of the river as it passes through a pine/beech forest with a thick understory of ferns and then arrives at the Downey's Access Site, another parking area for anglers. Charles Downey was one of the first sportsmen to own the tract after buying the land from an exclusive fishing club of which he was a member. The trail heads southeast from the parking area and in 200 yards arrives in an open, grassy area marked in the middle by post No. 5 at Mile 2.9. Nearby a pair of stone stairways, left over from Downey’s Place, lead down to the river, while just downstream in the water are the rocky remains of an old bridge. The trail is marked along the grassy bluff with six-foot posts. In another quarter mile, you arrive at another parking area and "Quality Fishing Area." sign that mars a cedar stairway that leads down to the river. Post No. 6 marks the junction to the Thayer Creek Loop and is reached at Mile 3.4. Stay left here, and the pathway re-enters a forest of primarily paper birch, beech, and assorted pine. Most of the time, you are close to the river, but you can't see it until the trail swings past the riverbank at Mile 4 and you get a splendid view upstream. On the other side of the South Branch, but nearly impossible to see, is the Mason Chapel, built in 1960 as a place of reverence for anglers. 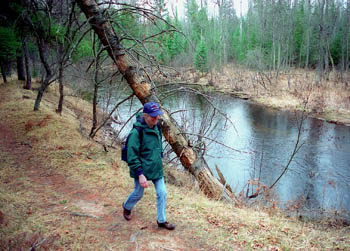 The trail swings away from the South Branch, enters a low-lying wet area, and at Mile 3.9 arrives at post No. 7, the return spur of the Thayer Creek Loop just before crossing a bridge over Thayer Creek. After ascending from the creek slightly, the trail merges into an old logging road. The main trail swings to the southwest (left) from the junction as it follows a logging road briefly, then veers to the left at a well-marked spot. You climb into a small, grassy clearing, re-enter the woods, and eventually emerge at a parking area and access. On the other side of the lot, the trail re-enters the forest and quickly begins skirting the bluffs known to fly fishermen as the High Banks for good reason. The South Branch is far below you, seen every now and then between the towering pines. At Mile 5.4, the pathway arrives at post No. 8, a prominent hill overlooking the river where there is a bench and a long stairway to the water. The South Branch forms a sharp bend here, and the view from the bench is of flowing water and towering red pines that shade the bluffs. This is the High Banks access site, and from here the trail gradually descends until it cuts across a low-lying wet area and comes to the banks of the South Branch. The river is briefly followed until the trail arrives at the remains of Durant's Castle at Mile 6. Only parts of a stone foundation and a fireplace are left, but in 1931 this site held a $500,000 home built by the automaker. The 42-room castle was a retreat for Durant, and included a drawing room, music room, library, barber shop, gymnasium, and seven fireplaces. What amused locals the most, though, was a ticker tape that kept the millionaire in contact with the New York stock market even in this getaway in the woods. The house only lasted a year, for it was destroyed by fire in February 1932. From the ruins, you ascend to a parking area with vault toilets and an interpretive display. A well-built trail leads down to a wooden landing deck on the river for canoeists. The trail resumes in the woods directly across from the covered display sign and resembles a two-track road here. You follow the track through the forest, passing a bench at the edge of a steep bluff. Just beyond, the trail veers off the logging road and ascends into an old clearcut that takes half mile to cross and then arrives at post No. 10 at Mile 7. Stay left at the post and re-enter the woods. The trail descends to an access to the South Branch and then crosses several low-lying wet areas, some with boardwalks, with the river in view to the south. At Mile 8.6 you arrive at post No. 11 where a spur leads down to the river. The trail levels out in the final mile, staying in the woods and close to Mason Tract Trail, the two-track that anglers use to access many of the access sites on the river. You do pass two more road access points before the final half mile. Finally the traffic on Chase Bridge Road becomes louder with every step and you emerge at the paved road, just north of the bridge and the canoe landing. Within the Mason Tract is Canoe Harbor State Forest Campground, Chase Bridge Public Access Site, the Mason Tract Pathway, and a portion of the Shore-to-Shore Riding and Hiking Trail. Just downriver, on the north side of M-72, is the Smith Bridge Public Access Site, At the Chase Bridge access site near the southern trailhead is a canoe landing, vault toilet, and a well. The only place where camping is allowed in the Mason Tract is Canoe Harbor Campground, that was exempt from Mason's camping ban because the area was federally owned at the time of the original gift. The state forest campground has 54 sites for tent and small trailers and 10 canoe group campsites as well as drinking water, vault toilets, and a canoe landing on the river. The Mason Tract is open year-round and during the winter the pathway attracts backcountry skiers and snowshoers. There are no fees for hiking in the Mason Tract but there is a nightly fee for staying at Canoe Harbor State Forest Campground. The pathway is within a half-hour drive of Grayling and Roscommon and is under a three-hour journey from such major metro areas as Detroit, Flint, Lansing, and Grand Rapids. From I-75, depart at exit 239 and head east on M-18 through town of Roscommon. To leave a car at the southern trailhead, turn north (left) on Chase Bridge Road (County Road 519) 2.5 miles out of Roscommon. The South Branch is 2 miles up the road, and the posted trailhead is on the north side of the river. 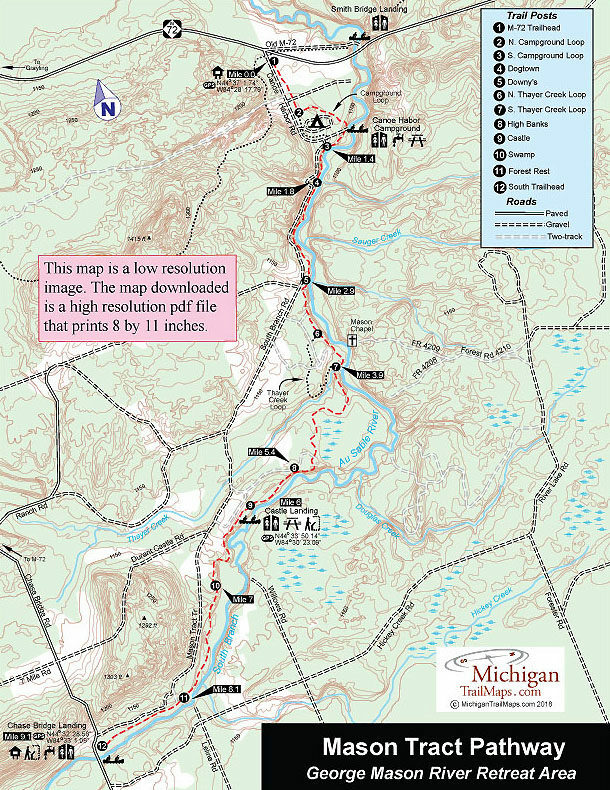 To reach the northern trailhead continue on M-18, and the road will swing north and reach M-72. Head 2 miles west (left) on M-72 to reach the entrance to the Mason Tract posted at Canoe Harbor Road. Turn south (left) on this dirt road and a parking lot and large trail sign soon appears to the east (left). If you continue on the dirt road past the trailhead, within half mile, you will pass the posted entrance to Canoe Harbor State Forest Campground. Contact the DNR Roscommon Field Office (989-275-5151).